Special! 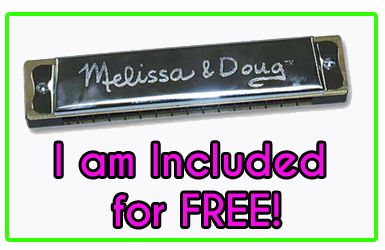 Free Harmonica with Melissa and Doug Baby Grand Piano and Free Shipping! Melissa & Doug Kids Baby Grand Piano with Free Harmonica and Free Shipping! Let's start our band right now! With this great savings of the Grand Piano with the Harmonica included for FREE your little is all set up to begin playing in her/his own band. Let the musical talents soar! Classically styled grand piano features a lifting top with safety hinge, 30 piano keys, songbook with color-coded key chart and a sturdy, non-tip piano bench! This is a beautiful piano piece that will look right at home in the family room, play room, bedroom or any room you choose to place it in. Dimensions: 1" x 1" x 5.25"
"This Grand Piano is a great introduction of the piano to your little ones. Very realistic and durable. [@]"
"My daughter loves it. I purchased the mini piano from my employer which came in an exclusive color,and my daughter enjoys thinking of music and expressing herself with the piano. I would recommend the product to anyone. It was easy set-up and fun entertainment." "I got this for my five year old this christmas 09 she LOVES it!! my only complaint would be is that i wish it came with more songs on the booklet. like an easy one and then the medium and hard one. other than that this toy rocks! it also looks so good in the living room with my furniture." "My daughter just turned one and we got her this toy and she is in love with it! It is so easy for her to use and she loves to make music on it!" Harmonica - "Purchased this for my son and had no idea how much fun he would have with it... I made one little sound on it and he grabbed it out of my hands and took off and played it for an hour the first night non-stop. It was not a bad noise at all... actually fun and funny and quite nice... nothing at all like loud toys. I just love seeing how much fun he has with it. He took it to his Pre-K class the other day for toy day and they said he played it for almost an hour till all the other children were having fits wanting to play it but they all loved it. So this is for sure money well spent!!!"